The Carbon-Z Yak 54 is No Ordinary Foamy! I'm a huge fan of E-Flite planes. They fly awesome. They're practically ready to fly right of the box. They are modular and easy to repair. They're durable and are not really affected by weather or direct sunlight. What can I say, they're awesome. My garage is full of them! Until now even the best of foam airplanes were limited by the strength and rigidity of foam wings. How fast can I go? How tight can I make that loop? How hard can I push this plane before the wing breaks or bends? Unfortunately I've found those limits the hard way a time or two. I can tell you from experience that these foams wings can't take the same abuse as traditional ribbed style built-up balsa wings. 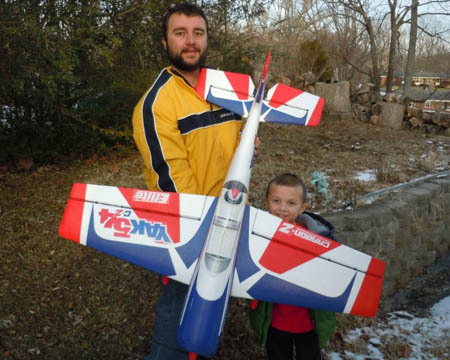 Up until now if you wanted a high performance aerobatic RC airplane that you can push to the limits, you would have to shell out some serious cash for a high-end built-up balsa or carbon fiber composite airframe. 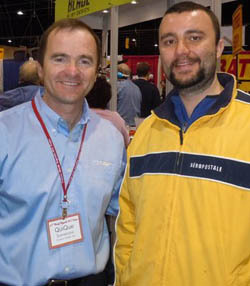 I had the honor of meeting Quique at the Toledo show in 2011. Not only is he an amazing pilot and RC plane designer, he's a super nice guy! World aerobatic champion Quique Somenzini came up with the new Carbon-Z wing construction that combines the best of both worlds. Now we can have all the characteristics that we love about Z-foam along with the lightweight, strength, and rigidity of traditional built-up balsa airframes. In simple terms, the E-Flite Carbon-Z Yak 54 can be flown much harder and with more precision than previous ParkZone airplanes. So what exactly is this new Carbon-Z design? The wings consist of two molded halves made from the same repairable Z-foam we've all come to love. Dead space is molded into the wing resembling ribs to save weight. The front and rear plywood spars and main carbon fiber rod fit between the two halves to give the wings unbelievable strength. In this demo, Quique applies 45 lbs of static weight to the center of one wing half and it doesn't budge! The E-Flite Yak 54 hinges are also a bit different than what we've seen before. The hinges consist of one long carbon fiber rod threaded through plastic hinge blades mounted to the wing and ailerons. This reduces the friction in the hinge which adds to the precision of the of the airplane. They are also much easier to repair than traditional hinges. It's no surprise that E-Flite provides equally impressive components to go along with their new wing design. This airplane comes equipped with digital high-speed metal-geared servos, high-performance custom glass reinforced propeller along with a high-output 25-size brushless power system. This combo gives the aircraft a thrust-to-weight ration of 2:1! If you think you're man enough to handle it, go ahead and get your E-Flight Carbon-Z Yak 54 BNF on order. The Plug N Play version is available if you've already got the battery and receiver. Please share your E-Flight Carbon-Z Yak 54 experiences along YouTube videos and pictures in the comments below!